Definition at line 437 of file llvosky.h. Definition at line 440 of file llvosky.h. Definition at line 441 of file llvosky.h. Definition at line 775 of file llvosky.h. References f, llfloor(), mCosMaxAngle, mMapSize, mStepInv, mT, LLColor3::mV, S32, LLColor3::setVec(), VX, VY, and VZ. Definition at line 274 of file llvosky.cpp. References calcSigExt(), EARTH_RADIUS, LLColor3::exp(), F_PI, FIRST_STEP, gFastLn, hitsAtmEdge(), INV_FIRST_STEP, INV_NO_STEPS, LLVector3::magVec(), NO_STEPS, LLFastLn::pow(), s, and S32. Definition at line 449 of file llvosky.h. Definition at line 459 of file llvosky.h. 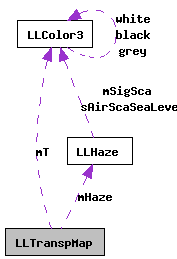 References LLHaze::calcAirSca(), LLHaze::calcSigExt(), hasHaze(), and mHaze. Definition at line 466 of file llvosky.h. Definition at line 454 of file llvosky.h. Definition at line 326 of file llvosky.cpp. Definition at line 251 of file llvosky.cpp. References calcAirTranspDir(), EARTH_RADIUS, i, mAtmHeight, mCosMaxAngle, mElevation, mHaze, mMapSize, mStep, mStepInv, mT, and S32. Definition at line 470 of file llvosky.h. Referenced by hitsAtmEdge(), and init(). Definition at line 473 of file llvosky.h. Referenced by calcAirTransp(), and init(). Definition at line 471 of file llvosky.h. Definition at line 477 of file llvosky.h. Referenced by calcSigExt(), hasHaze(), and init(). Definition at line 476 of file llvosky.h. Referenced by calcAirTransp(), getHorizonAirTransp(), and init(). Definition at line 472 of file llvosky.h. Definition at line 474 of file llvosky.h. Definition at line 475 of file llvosky.h. Definition at line 478 of file llvosky.h. Referenced by calcAirTransp(), getHorizonAirTransp(), init(), and ~LLTranspMap().